It’s still early, but Ted Cruz doesn’t appear any closer to getting over his crushing defeat by Donald Trump and the end of his presidential dream. While attending the Kentucky Derby, Ted was asked by an MSNBC reporter if he would support Donald Trump. Cruz, who signed the “GOP Oath” and condemned Trump for not “raising his hand” at the first Fox News GOP Debate, is now reneging on his promise to support the Republican nominee. “I’m Not Supporting Donald Duck and I Don’t Want To Be Donald Duck’s VP!” the nasally, thin-skinned Canadian screeched. Interestingly, no one can confirm if Ted Cruz was ever on a long list or any list, for that matter, of likely running mates for Trump. If he had said it wouln't we see it all over media? Mind you I haven't had TV on and ignored pro-hilnevertrump sites today. Somebody needs to tell the Cruz insider that Americans overwhelmingly rejected Snidely Whiplash the ineligible Canadian in favor of Donald Duck. TV and radio off for days while we've been moving a travel trailer and it's been bliss. I'll probably turn on today for a bit just to see the election results but that's it. I plan to continue my experiment as long as possible. I think I needed the cold-turkey remedy. I'm finding I don't miss listening to the gasbags from the cynical, clueless media class one bit. They just don't get it. We are all MUCH smarter. If they got it or admitted they got it the gasbags would be summarily unemployed. Ted Cruz sure isn't the guy I though he was at first and I'm glad I saw the light. He really has no path to victory - save thwarting the will of the voters. But he's OK with that, because it's really all about him - not America. Because what he is doing right now is hurting us in the fight against Hillary. I'm like Alicewonders in that I, too, was an admirer of Cruz, but he has hurt himself badly during this campaign and (I hate to say it) revealed why he is so unpopular among his Senatorial colleagues. Now he's carrying his recalcitrant attitude even further. Ted Cruz floated the possibility of restarting his presidential campaign if he wins Nebraska's GOP primary on Tuesday and avoided saying whether he supports Donald Trump's bid for president. Cruz, who suspended his White House run last week, said he does not expect to win Nebraska's primary but is leaving the door open. 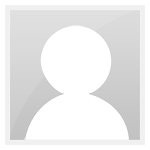 "We launched this campaign intending to win. The reason we suspended our campaign was that with the Indiana loss, I felt there was no path to victory," he said Tuesday on conservative host Glenn Beck's radio program. "If that changes, we will certainly respond accordingly." Ted, please, it's over. Display some humility and maturity. Drop out completely and endorse your Party's nominee as you pledged to do. I can't believe how wrong I was about Cruz. He's just as self-centered a personality as Trump, but without Trump's ability to reach out to the average person and relate to them and their concerns. Cruz is extraordinarily unlikable. A brilliant scholar and probably the smartest person in DC now that Newt and Bill Clinton are gone, but again, he lacks the political touch of the latter two. He's destined for an AG role, at best. I don't see him ever getting enough votes from the Senate for a SCOTUS spot barring some huge GOPe losses over the next twelve years. He's alienated everyone. Even Jeff Sessions knew he was a loser. I was not in favor of Cruz because of his history on 'Free Trade' agreements which eviscerate our national sovereignty, and his support of 'legal immigration' which has wiped out opportunities for newly graduated and experienced Americans in STEM careers. In addition there is that pesky NBC thing. That being said, Cruz has not only lived down to my expectations he has sunk way below them. Ted Cruz floated the possibility of restarting his presidential campaign if he wins Nebraska’s GOP primary on Tuesday and avoided saying whether he supports Donald Trump's bid for president. "He called Cruz "one hell of a competitor," calling his decision to drop out of the race "brave." He also said that while he wasn't sure if Cruz likes him, he praised his former rival as a "smart" and "tough guy" who had an "amazing future" ahead of him." Agree! plus we saw Ted decide to partner with the GOPe to deny the voter's their choice. Trump continues to make all the right enemies. Trying to purge GOP doubters might doom his candidacy. Mr. Trump’s threats against GOP doubters escalated over the weekend, especially against House Speaker Paul Ryan for saying on Thursday he wasn’t yet ready to endorse the businessman. The two men are set to meet in Washington on Thursday. But in the meantime Mr. Trump is resorting to political threats to force Mr. Ryan to bend to his will. The Trump camp also unleashed Sarah Palin to announce on CNN that Mr. Ryan’s career is probably “over” and she will lead an effort to defeat him in his Republican primary in Wisconsin later this year. “I think Paul Ryan is soon to be ‘Cantored,’ as in Eric Cantor,” said Mrs. Palin, who endorsed Mr. Trump in Iowa before he lost to Ted Cruz. Mr. Cantor, the former House Majority Leader, lost his Virginia primary in 2014. Mrs. Palin resides in her own private Idaho, but her threats echo those from other Trump advocates. Mr. Trump keeps saying he can win states like Wisconsin, and apparently he thinks the way to do it is by purging the Ryan wing of the GOP from the new Trump Party. “Paul Ryan said that I inherited something very special, the Republican Party. Wrong, I didn’t inherit it, I won it with millions of voters!” Mr. Trump tweeted on May 6. But the Republican Party is not one of his golf courses for which he can determine who has what tee times. A political party is an alliance of people who share enough principles to unite to win elections and run the government. They can’t be ordered around by Don Corleone-style threats. They have to be persuaded and mobilized. Are Mr. Trump and his campaign going to require loyalty oaths of every Republican officeholder who wants to attend the convention? All of this is more perilous for Mr. Trump’s candidacy than he and his allies seem to appreciate. Like Mr. Ryan, hundreds of GOP officeholders and candidates are deciding whether to endorse Mr. Trump or keep their distance. Thousands of potential donors are deciding whether to support Mr. Trump or devote their efforts to staving off losses in the House and Senate. More immediately dangerous to his chances in November, some conservatives are trying to recruit a major GOP figure to run as a third-party candidate. We have discouraged this as likely to elect Hillary Clinton and perhaps lead to GOP losses down-ballot. The U.S. can’t afford another run of unrestrained progressive government. If Mr. Trump really wants to be President, as opposed to losing as a populist martyr, he has to build a broader coalition. He needs to persuade doubters not by lashing out but by sounding like a potential President. He needs to find a running mate people will respect and advisers willing to serve in his Administration. And he needs to give thoughtful speeches with specific ideas for reviving economic growth and keeping the country safe. Time is more fleeting than he seems to think. If he doesn’t act more like a genuine leader soon, he may find that his candidacy has imploded before he is even nominated. Yes, I thought Trump's remarks about Ted Cruz when he dropped out were classy. I don't think I saw anywhere where Cruz congratulated Trump or even mentioned his name during his campaign suspension speech. I can see where his colleagues wouldn't like him. I see that Cruz was at the Kentucky Derby this weekend. He was seating with all the big money types. I noticed that too. Maybe Ted was at the Kentucky Derby as Mitch McConnell's guest?
" 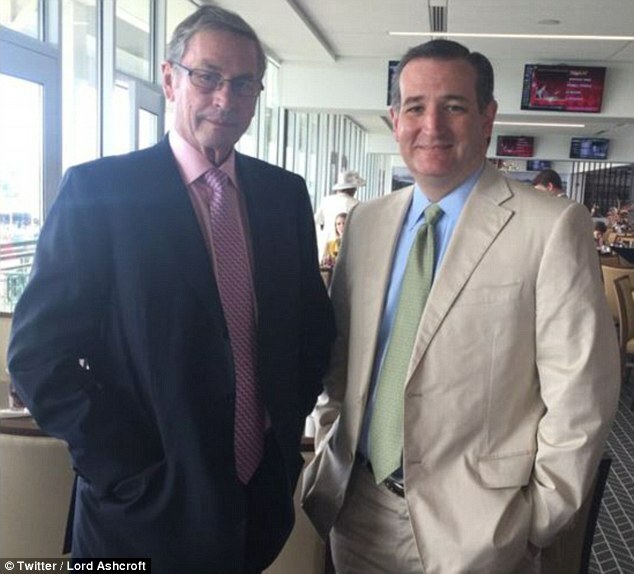 Cruz reportedly hung out with Lord Ashcroft on Millionaire's Row..."
edit: I found a pic of Lord Ashcroft with Ted..... oh boy!!! Cruz: "We Don't Need Another Lecture on Islamophobia"